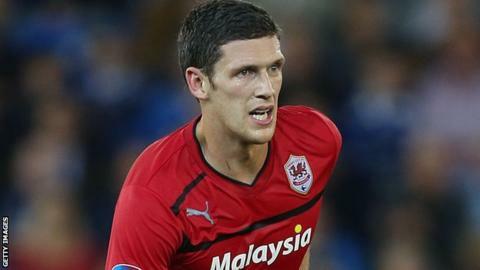 Captain Mark Hudson believes Cardiff City's current squad has strength in depth and is full of potential match-winners. Cardiff, who travel to Millwall on Tuesday, are fifth in the Championship following the 2-1 home win over Leeds United. The Bluebirds have added 10 new players to the squad that failed in the play-offs for the third successive season. "[This] is the best squad I've been involved with by far," Hudson said. "We've got that depth we needed last year and we didn't have and you look around, we've definitely got that this year." Peter Whittingham is Cardiff's leading scorer with four goals, while summer recruit Heidar Helguson has netted twice so far this season. Centre-back Hudson has scored once himself this season and the skipper says a squad that boasts new forwards such as Craig Bellamy, Nicky Maynard and Etien Velikonja will not struggle for goals. "You look around the dressing room and you've got so many match-winners and people who are going to work hard for you," Hudson added. "The match-winners we've got in the team is brilliant and can come from anywhere. "I see it in training every day - the finishing's second to none. I'm sure we've got more goals to come." Bellamy scored his first goal since returning to Cardiff in last Saturday's 2-1 win over Leeds but manager Malky Mackay says the striker is unlikely to start at Millwall. Mackay says he is keen to protect the 33-year-old after his calf strain that saw him miss recent matches for Cardiff and Wales. Although Hudson has the captain's armband at Cardiff, the defender says Bellamy also shows leadership on the pitch. Bellamy replaced Hudson as Cardiff skipper when he joined for a season-long loan from Manchester City during the 2010-11 campaign when Dave Jones was manager. "He is a captain in his own right. The experience he brings to the team is second to none," Hudson said. "The quality he brings, the intensity he trains at, everyone has to be at that standard. "We all want to get to where he's been. We all look at him day to day and the way he goes about his job."